If you wish to travel to Macclesfield this Saturday please book your place as soon as possible by contacting Phil on 07871991474. The fare is £11 for members and £16 for non members and will depart the Merseyrail Community Stadium at 12.30pm. A decision on whether the coach will run will be made in the next 24 hours. 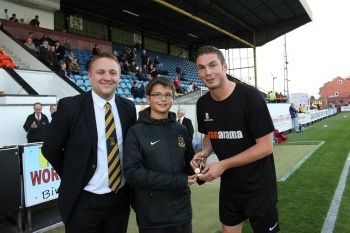 Richard Brodie has been voted Trust in Yellow’s Player of the Month for August. The Southport striker won the award after beating team-mates Dominic Collins and Luke Foster in the supporters’ poll. He was presented with his award ahead of the win against Kidderminster Harriers on Tuesday night by Southport supporter Kane Shaw. Also pictured is Trust board member Noel Warham. With three goals, Brodie was Southport’s leading scorer in the first month of the season, capping a number of good performances by finding the target in the win over Altrincham and netting a brace against Telford United. Thanks to everyone who voted. Supporters will be able to vote in September’s award at the end of the month, with the presentation again made by a supporter. Bookings are being taken to the matches at Chester and Macclesfield Town, as well as the trip to Grimsby Town. Details of the Trusts coaches are below. Under 16s can travel for half of the advertised price if accompanied by an adult. Prices are based on a break-even basis and a discount may apply if there are more than 30 bookings on any of the trips. The prices also reflect a £3 discount for paying in advance. To book, call Phil Carder on 07871991474. Chester, Tuesday 16 September. Departs Merseyrail Community Stadium at 5.15pm. Price £11 members, £16 non-members, if paid in advance. Macclesfield Town, Saturday 20 September. Departs Merseyrail Community Stadium at 12.30pm. Price £11 members, £16 non-members, if paid in advance. Grimsby Town, Tuesday 30 September. Departs Merseyrail Community Stadium at 2.30pm. Price £24 members, £29 non-members, if paid in advance. To book any of the trips, call Phil Carder on 07871991474. Alan gave an overview of Trust activities for the last 12 months including the floodlights project which is finally near to completion, providing coach travel to as many games as possible, holding meet the manager sessions, the World Cup Sweepstake, the fan of the season/player of the month awards, player sponsorship and the Race Night. Thanks were also extended to former board members Rob & Julia Urwin for all their hard work both whilst on the committee and as Trust members. The Trusts balance currently stands at £25,762. The vast majority of this will be used up as part of the Trusts contribution to the floodlights. The Trust has donated over £26,000 to the club since its formation in 2006. The shares issued to the Trust for its contribution to the floodlights project will make TIY the third largest shareholder in Southport Football Club. If any member would like a copy of the detailed accounts compiled by Treasurer Phil Carder either contact a member of the Trust board or call into the Trust office on a matchday. Bill reported that the Trust currently has 230 members. There have been 24 new members joining since the start of the year with an impressive 19 of these joining since the leaflet drive during pre-season. Renewal reminders being sent out by e-mail have also helped but the major factor in boosting membership levels is on pitch success. Chairman Alan Scarisbrick was re-elected. Elected to the board for the first time were Katrina Taylor, Noel Warham and James Treadwell. Colin reported that several companies are interested in joining the Barbers Parlour in providing offers for Trust members. The Trust can provide local businesses with exposure on its website and newsletter and Haydn Preece also kindly offered free advertising on the clubs official website as well as matchday hospitality tickets. The annual Race Night is likely to take place on Saturday 18th October although this is yet to be confirmed. A quiz night is also in the pipeline possibly taking place in the New Year. A number of player worn shirts have recently been donated which will be either auctioned off or used as raffle prizes. The Celebration Wall will possibly be located on the side of the club shop and the webshop and Easyfundraising are continuing to raise money. The Trust will discuss with the club the possibility of raising money for improved disabled facilities when the floodlights project has been completed. Coaches were run to the games at Halifax and Telford and have recorded a slight profit so far. The weekend trip will probably be to Bristol in April travelling down on the Friday and returning on the Sunday. The option to pay in instalments will be available to anyone interested in going. Haydn Preece provided a detailed outline of the many current and future initiatives that form the clubs community delivery. Of the 68 Conference clubs Southport Football Club was awarded 2nd place in the Community Club Of The Year award during the summer. The community coaching is looking to be expanded to include secondary schools and the Trust is keen to support at least some part of this. Alan Scarisbrick took the ice bucket challenge to raise money for Motor Neurone Disease. There were 25 replies to the questionnaire issued as part of the Trusts leaflet drive which will be discussed at the next meeting. Tilly the TIY Teddy continues to travel round the world visiting Thailand, Russia and the USA amongst other exotic locations.